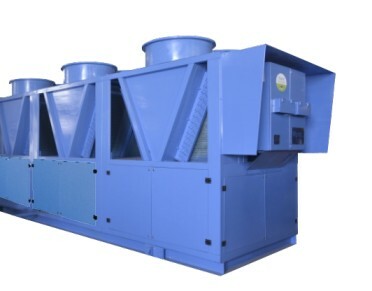 The Air-cooled Screw Chillers are suitable for working in extreme tropical weather conditions with maintaining energy and operational efficiency. The equipment is designed and manufactured in compliance with superior designing and manufacturing standards. The environment friendly chillers are easy to install and are tested on all the required international parameters to be at par with the best. Reynold Water-cooled Screw Chillers are designed to work within extreme tropicalized weather conditions, while maintaining the highest energy efficiency. Designing and the choice of equipment are critical to conform to superior standards. Manufacturing and testing standards at our facilities are at par with the best, internationally. Installed equipments are operation friendly and are backed by competent engineering team to realize the advantage while being in operation. 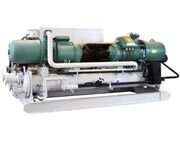 The Industrial Screw Chillers are designed and manufactured for the cooling processes, where each process is completely different from the other. The industrial chillers are designed using qualitative materials and metallurgy and are fitted with the most efficient compressors from Europe. The materials and metallurgies are chosen according to the process fluid being used as per the specific process requirements.